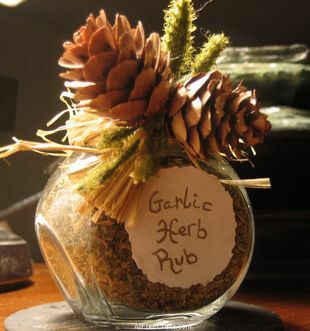 This homemade garlic and herb jar mix is a staple in my house. You can make put it together very quickly, from ingredients that you may already have in your spice cupboard. Most people enjoy the herbs and spices used in this recipe; none are too pungent or powerful, but all add a pleasing flavor note to otherwise everyday fish and meat dishes. Wonderfully fragrant, inexpensive, and versatile, it also makes an ideal jar gift for friends and family. 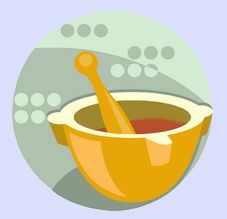 The following recipe will yield approximately half a cup. Just double, triple, or quadruple the ratio of ingredients to prepare multiple jars for gift giving (not forgetting, of course, to keep some back for your own family)! Yield: About half a cup. Combine all ingredients in a small bowl, stirring well. Use a funnel to pour the mixture into a glass spice jar. A plastic sprinkle tab, such as those usually found beneath the lid of commercial spice jars, is useful for distributing this mix but not essential. Fasten the jar lid. If desired, decorate the jar for gift giving. 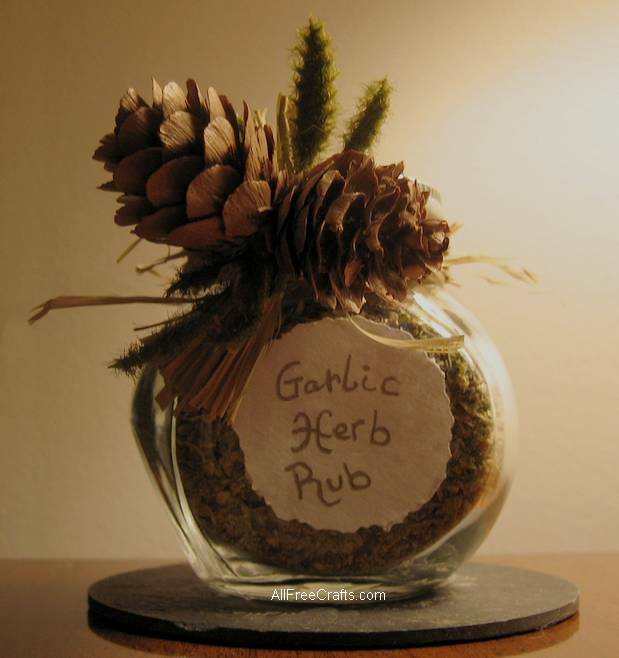 I cut a circle from an adhesive label, using decorative edged scissors, then I wrote “Garlic Herb Rub” on the label using a gold gel pen. Attach the label to the front of the jar. Glue two small pinecones and a small amount of greenery to the center of 4 or 5 strands of raffia. Center the pinecones on the front of the jar and tie the raffia at the back of the jar, just below the lid. Write the following directions for using the rub on a label to glue to the back of the jar. Sprinkle 1 tbsp. of Garlic Herb Rub on 1 lb. of fish, chicken, pork, lamb or beef. Rub mix into the fish or meat with your fingers. Cook as desired (See recipe below for Garlic Herb Chicken). If life hands you a lemon, but you don’t have any dried lemon peel for this recipe, make your own. 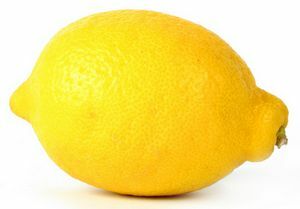 Wash the lemon well, then use a sharp knife or a steel grater to remove lemon peel, being careful to avoid most of the white pith below the peel. Cut the peel into small strips and set on a plate to dry for a day or two. When the peel has dried and curled up, crush to small granule consistency using a mortar and pestle or reduce to powder in the food processor. See How to Make Lemon Pepper for detailed instructions on making lemon zest and a to-die-for, penultimate, Homemade Lemon Pepper recipe. Love this. It makes me want to add a rating system for recipes, because I’d give it 5 stars, and so would my husband. It turned a weeknight meal of cheap chicken thighs into something worthy of more. The rub adds depth and flavor, but doesn’t overwhelm the taste of roasted chicken. If you think so too, let me know in the comments! Preheat oven to 350 degrees. Place chicken pieces (wings, thighs, breast or thighs) in a greased baking dish. Sprinkle with Garlic Herb Rub and gently press the herbs and spices into the top of chicken pieces. Place in the oven and bake for 15 minutes. Take out of the oven, move the pieces around a little to prevent them sticking to the pan. Gently baste chicken pieces with juices from the bottom of the pan. Place back in the oven and finish baking until chicken pieces are golden brown and the skin (if present) is crispy. Serve warm, with crusty bread and butter, baked potato and salad.